This connector only supports user import. PlayVox will enable an FTP server for calls to be sent to. There's a configuration step that must be done within Five9 for the calls to be sent to PlayVox's FTP server. Five9 may charge an additional cost for this. FYI: * You will need data from the Five9 Chat’s account owner. As you set up PlayVox’s software, you’ll be named an admin user. Name: it is the connector’s name - you may have multiple connections and it is important for you to be able to properly identify them (i.e. Five9’s chat 1, India’s emails, Technical support chat, etc.). 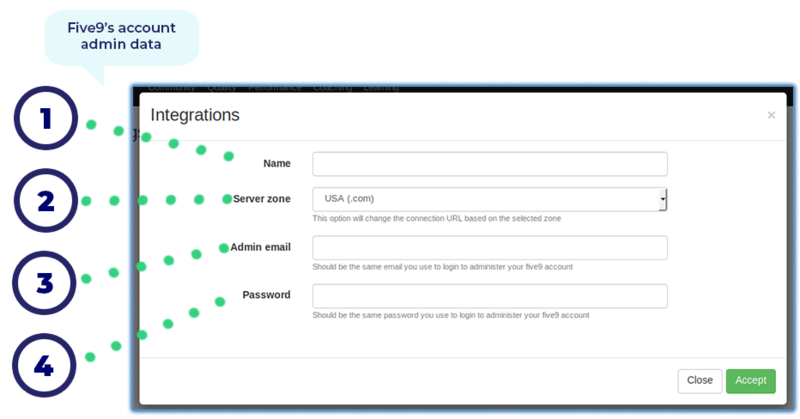 Server Zone: depending on where your server is located (if you don’t know simply ask an IT coworker) simply choose one of the displayed options. Now that you have all the data you’ll need you can continue with the connection process.